The advent of intravesical immunotherapy therapy has significantly improved outcome in high-risk bladder tumors, but the natural history of these tumors following immunotherapy failure is unknown. We report our institution’s experience with bacillus Calmette-Guerin (BCG) alone and combined with interferon-α2B (INF) in regards to bladder cancer recurrence, disease progression, eventual cystectomy following initial BCG failure. We identified a consecutive series of 139 patients undergoing intravesical instillations of BCG alone (n=114) or with interferon-α2B (n=25) performed at Brigham and Women’s Hospital, Boston between 2002 and 2007. Time to cancer recurrence, progression of disease, eventual cystectomy and mortality were analyzed. 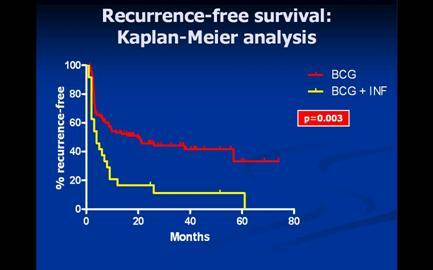 At a median follow-up of 64.7 months from initial BCG administration, 84% treated with BCG + INF had disease recurrence. The average time to recurrence was less than one year, and 63% of these patients had recurrence on the first post-treatment biopsy. Disease progression was seen in 48% of patient receiving BCG + INF therapy, and 28% of all patients eventually underwent radical cystectomy. Only one patient died during this period. Combination BCG + INF immunotherapy may have a short-term therapeutic benefit on cancer recurrence, but we did not find evidence that it significantly decreases disease progression. Patients undergoing salvage intravesical interferon at our institution have greater than a 50% chance of recurrence and progression, and over one-quarter eventually proceed to radical cystectomy.